Cathy Corison produces three Napa Valley Cabernet Sauvignons, each hand-crafted without compromise from benchland vineyards between Rutherford and St. Helena. Exhibiting both power and elegance, her wines speak of place, are made to grace the table and enjoy a long, distinguished life. Kronos Vineyard Cabernet Sauvignon is Cathy's first single-vineyard estate wine. At over 45 years of age, the Kronos Vineyard is one of the last old Cabernet vineyards in the Napa Valley, producing wines of amazing power and elegance. Sunbasket Vineyard, our newest vineyard-designate, was purchased in 2015, though we had sourced it for over a quarter-century. It has long contributed a pretty, bright core of cherries and blueberries to our Napa Valley Cabernet. We select this very limited bottling from our favorite barrels. View from Tasting Room: Visitors walk among the vines in our Kronos Vineyard with expansive views of the western hills and Mayacamas range. Wine Education: Guests choosing our Library Experience learn how wines develop over time. To join the wine club, visit www.corison.com or call 707-963-0826. Corison Collectors is a wine club that offers two shipments of Corison wines each year. 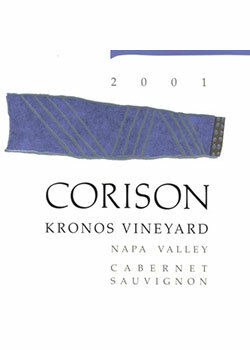 We ship Corison Napa Valley Cabernet at release time in the fall. And in the spring, we ship our Kronos Vineyard new release offering. Additional small lot varietals are available to add to your club membership. Two-for-One Corison Library Tasting and Kronos Vineyard Tour: This signature tasting features a guided tour of our winery and sustainably farmed Kronos Vineyard, followed by a formal seated tasting of several vintages from our library of aged Cabernet Sauvignon. When available, this might include our estate wine, Kronos, and other varietal small lot wines crafted by Cathy. An appointment is required. Please mention Napa Neighbors when making your reservation.